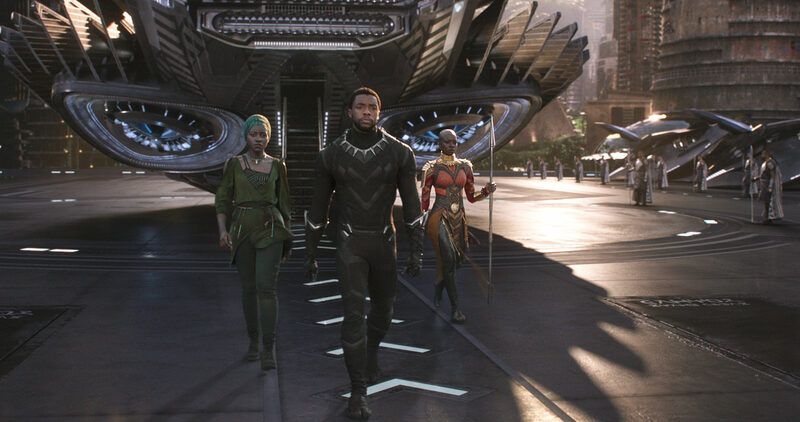 By now, you likely have seen Marvel’s latest trailer for Black Panther—if you haven’t, I strongly recommend that you take a few minutes and rectify that immediately. The anticipation for this release is due as much to the gripping visuals and ensemble cast as it is to the fact that this is only Marvel’s second superhero film in which the primary protagonist is black (the first, of course, being the woefully overlooked and underrated Blade). It is shaping up to be a remarkable American film. A predominantly nonwhite cast leading a big-studio genre picture? And it looks like they gave a damn? True, there have been many American films with predominantly nonwhite casts over the past few decades, but just as this summer’s Wonder Woman stood out for female-led productions because of the type of film and the amount of studio weight behind it, so it goes for Black Panther. And yes, that is a big deal. Not solely because of the presumably lower SPF requirements of the cast and above-line crew but also because of the effect that the skin tone of the cast will likely have on nonblack audiences. The impact of those nonblack audiences will be monumentally beneficial. America is a media-consumer culture: film, television, digital content, and print are incredibly influential in terms of shaping attitudes. A small-town kid in some flyover state—or, sadly, really any town in any state—who only sees movies in which a heroic Aryan hero beats up evil black and brown criminals is formulating preconceptions about black and brown people offscreen. The “shock” of or resistance to seeing real-world people of color who don’t speak “jive,” sell dope, or boost cars can be eradicated through increased exposure to depictions of people of color speaking and living not too dissimilar to themselves. In other words, white fans seeing more nonwhite characters as people will absolutely yield positive results. To avoid tumbling down a slippery slope, let me clarify what I mean when I talk about representation. To put it simply, I’m referring to images in media of human and humanlike characters who possess aesthetic similarities to the viewer and/or belong to the same societal demographic. I’m speaking specifically about the casts of films, television, and other mediua, not the crew—behind-the-scenes representation is important, too, but it’s important for other reasons (namely economic and vocational) and are not what’s at issue here. Unless you’re a bigot, it’s impossible and ludicrous to attribute discernible skill levels and quality of storytelling to racial or gender attributes. Empirical experience is irrelevant to storytelling and filmmaking; for hard evidence, look no further than The Hurricane, In the Heat of the Night, A Soldier’s Story, Ray, Amistad, Straight outta Compton, Beasts of the Southern Wild, Get On Up, Django Unchained, 42, or The Color Purple. The cornerstone of black cinematic storytelling, Roots, saw seven of its eight episodes helmed by white directors. Hell, even the Black Panther comic character on which the upcoming film is based was created by Jack Kirby and Stan Lee, two extremely not-black artists. So this isn’t about the production crew, even though it’s phenomenal, but about the faces audiences will see onscreen. Yes, there’s something beyond significant about seeing characters who resemble your real-life experiences—don’t get me wrong, I’m envious of young kids of color who get to have what we could only imagine back in my day—but if the project is well crafted, with strong performances and story, then the relatability factors can almost supersede aesthetic (almost). This is something that fans of color, and those who identify as women, have done for generations. And that’s one of the most overlooked factors in the reactions around the Internet when it comes to the new trailer—this will be amazing for fans of color and it will be amazing for other fans too! Particularly if they’re impressionable. Case in point: my favorite superhero of all time is Wonder Woman. I’ve been reading her titles since before middle school. I felt connected to the character for numerous reasons, but it wasn’t because I was also a muscular, Amazonian royal with lush, raven-black hair and a Xena physique. (I’m still not, BTW.) But more importantly, my obsessive fandom of the Princess of Themyscira/God of War lead to finding other titles driven by female characters—Tank Girl!Angela! Sensational She-Hulk! Lady Death! Witchblade! Then came television and films—Foxy Brown! Angel Sabrina and Angel Kelly! Punky Brewster! Alice from Resident Evil! Agent Scully! Ripley! Buffy! Veronica Mars! Over the years, all of that exposure to and appreciation of strong characters of a gender different than my own definitely contributed in no small way to my egalitarian view of gender identity. I couldn’t see women, or female characters as lampshades or merely romantic or sexual rewards for a hero; they were the hero! Clearly, other factors in my upbringing helped shape my equitable outlook, but it absolutely didn’t hurt that I was immersed in worlds in which women characters were on par with (or far groovier than) their male counterparts, and I took that attitude into the real world. There are numerous anecdotal cases like this. Perhaps you’ve encountered someone who says, “Yeah man, Mexicans are taking are all the jobs! They should be sent back to where they came from! Not Mike at work though—he’s pretty cool.” Or, “They shouldn’t change characters from how they’re drawn! That betrays the story! But Death Note on Netflix is awesome.” These little exceptions are how we can slowly chip away at the ignorance plaguing the geek community (and our country). When someone encounters enough exceptions to a “rule,” they stop being exceptions and become the new rule. If Black Panther is even a quarter as amazing as its trailers, then it’s going to be a box-office smash. Hollywood follows the money, and if and when this film cleans up—especially considering how well Wonder Woman did this summer—studios will start looking to cash in on diversity of characters. Yes, they’ll be doing it for the money and not necessarily for the goal of diversifying content, but when it comes down to it, it’s less about the why and more about the how . . . as in, how many other awesome non-status-quo characters and stories can we get to audiences next? Diversity of characters and stories absolutely impacts the audience. Backed by the massive prominence and dominance of Marvel, Black Panther is sure to make a pop-cultural impact. But realize that this isn’t just about the story contained within the run time of a motion picture. The merchandising and cross-promotion and sponsorship messages and toys and games and costumes and video games and product placement of the contemporary marketing framework in which Marvel and Disney hold sway guarantee immense cultural saturation of any of their films. The fact that all of that power is being bestowed upon Black Panther is not only historic and unprecedented but a cultural necessity.